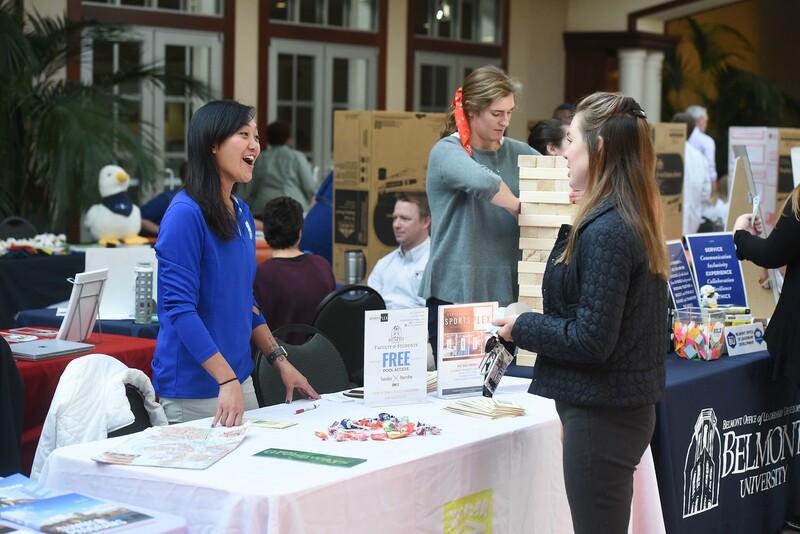 Belmont University recently hosted its first Health and Well-being Fair, an event sponsored by the University’s Be Well BU initiative to promote a health and well-balanced lifestyle throughout the Belmont community. The fair showcased over 40 organizations focused on sharing information about a variety of topics with students, faculty and staff in attendance. The Be Well BU initiative encourages the Belmont community to live a healthy balanced lifestyle through exploring nine different areas of wellness including spiritual, cultural, emotional, occupational, physical, interpersonal, environmental, intellectual and financial wellness. These nine areas were represented by a variety of organizations at the fair. Several of the booths featured businesses from around Nashville including insurance companies, physical therapists, massage therapists and several others, each promoting one of the nine types of wellness. One of the most featured types was physical wellness with organizations like The Crag, a rock climbing facility, Centennial Sportsplex, the YMCA and Belmont’s own FitRec Center. Besides fitness and recreation, many other Belmont groups were showcased to educate students, faculty and staff about the resources available to them on campus. University Ministries, Campus Security, Counseling Services and Dining Services were just a few of the groups present. Students were also assisting in facilitating the fair by helping run several booths. College of Pharmacy students gave flu shots and checked attendees’ blood pressure. Nursing students presented infographics, from a class, to educate people on several aspects of health and well-being.